Home | Interactive Maps | Quizzes | Image Archive | Links | Contact | Join our Email list! The Assyrians burst into the political scene of Mesopotamia at the end of the Bronze Age as a warlike tribe from the northern fringes of Mesopotamia. At the end of the Thirteenth Century, the Assyrian King Tikulti-Ninurta I swept into lower Mesopotamia and conquered Babylon, bringing all of Mesopotamia under Assyrian rule. Following Tikulti-Ninurta I’s murder at the hands of his own sons, the Assyrian Empire went into decline for the next few centuries. But at the dawn of the Iron Age, the Assyrians were back and stronger than ever. By the reign of Ashurbanipal in the mid-seventh century BC, the Assyrians had conquered virtually the entire known world from the Zagros Mountains of Persia in the East, to Egypt and Eastern Anatolia in the West: the largest Empire the World had yet seen. Assyrian Art was some of the most detailed and realistic the world had yet seen, the artistic themes concentrated on hunting, displaying the grandeur of Assyrian Kings, war-making, and the depiction of brutal massacres and torture of subjugated peoples. The Assyrians took pride in cruelty and oppression of their subjects, and used their art as propaganda to scare them into submission. 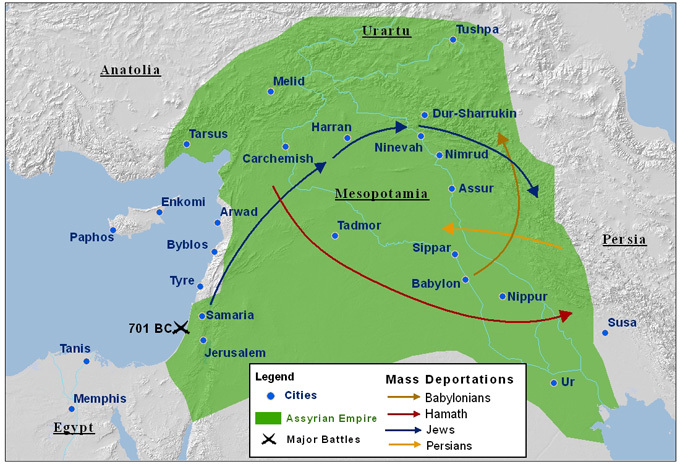 The Assyrians were also the first empire to practice forced migrations of conquered peoples on a mass scale, they understood that peoples were less likely to rebel if they were removed from their homelands and resettled in foreign lands with alien languages and cultures. One such forced migration was that of the Jews of Israel, the story of which is recounted in both Biblical and Assyrian texts. For much of the Early Iron Age, living in the Middle East would have meant living under the brutal rule of the Assyrian Empire. But Assyrian influence was felt far beyond the boundaries of the Empire itself, the entire Mediterranean, as far as Iberia was transformed by Assyrian hunger for metal resources. The Assyrians themselves were not great sailors, but they tolerated the independence of the Phoenician coastal city-states on the condition that they pay heavy tribute to the Assyrian crown. The Assyrian demand for precious metals was the main cause of Phoenician colonization in the Western Mediterranean.